Subaru is celebrating 50 years of its boxer engine with a run of 100 Special Edition Foresters, available from September 1 and priced from £29,995. Finished in Hunter Green Metallic, the Special Edition is based on XC Premium trim, but gains additional underbody protection, wheel arch extensions and a stainless steel cargo step. It also features a brown leather interior. These extras are worth £1500 in total, but are fitted at no extra cost. Also standard is 7.0-inch touchscreen, navigation and hill descent control. All Special Editions come with a Lineartronic CVT automatic transmission, linked to either a petrol or diesel engine, the latter of which is priced at £31,495. Love the colour, would have to see the brown leather in the flesh. I've had many Subarus down the years, I have a current model Forester at the moment, plus an Outback and my wife has an XV. I've yet to have one let me down. 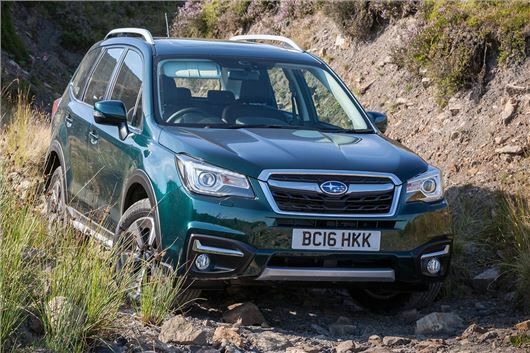 It's nice to see Subaru doing well in the UK with year on year sales increasing. I think the 100 of these limited models will prove popular with the faithful.